This skin-smoothing body polish is made from shea butter, sweet almond oil, peach seed powder, sea salt, and sugar for a formula that eliminates dry skin. 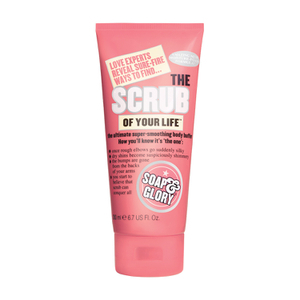 The alluring scent of Soap & Glory's signature Original Pink™ Fragrance - combines fresh bergamot, mandarin, rose, jasmine, peach, strawberry, and soft musk & amber base notes. Skin is left delicately fragranced, hydrated, super soft, smooth and conditioned. Apply a handful of FLAKE AWAY™ onto damp skin and massage in circular motions until most of the grains are gone.Rinse well, pat dry, and apply a moisture butter such as The Righteous Butter™.